» Show off your Dwm configuration! Re: Show off your Dwm configuration! Ratpoison cursor themes (X_cursor, icon). With all respect... But what the h*ll is that wallpaper? Nasty. Really nasty. I love GnuEmacs, GnuScreen, ratpoison, and conkeror. Hey, I know it's long ago but… how did you managed to get such a dropbox icon instead of the blue one? Just overwrite default icons at /opt/dropbox/icons/hicolor/16x16/status (I used icons from ACYL icon theme). everytime i change my configuration to something colorful i find beautiful, minimal, black, gray screenshot that makes me want to play with the colors again, like this one. Glad you like it! The sound and bat icon changes depending on state (ac or bat) and depending on level (%). 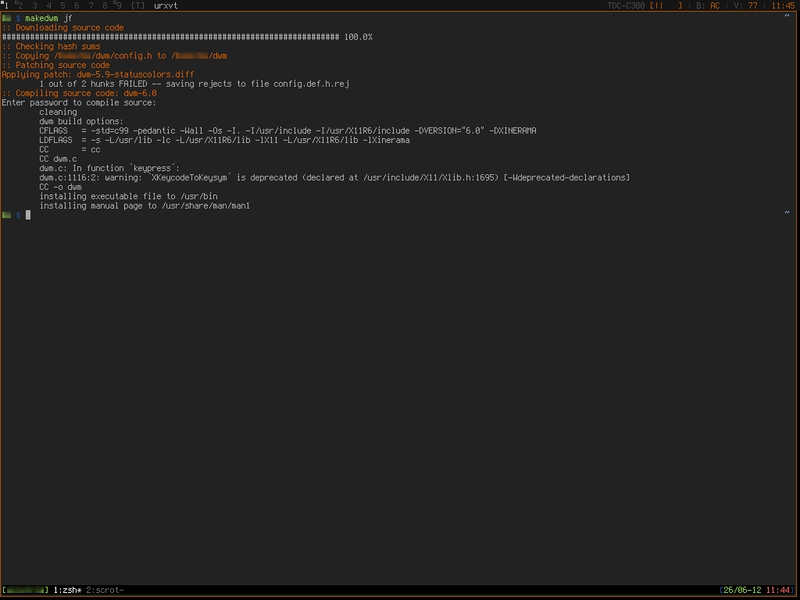 statuscolors-patch, noborder-patch, zsh, and tmux. Someone knows a good guide for a dwm statusbar? I'm not that firm when it comes to powersaving with shellscript. Can't figure out how to send a PM in fluxBB. Please excuse this off-topic post. I might have some tips. I got tired of not having instant volume-updates, and also having set the update time for my bar to 1 second, so I did some changes. Now I start several functions, each with their own sleep time. Each of these functions will save their output in a folder on my ramdisk. My .xinitrc will also load the statusbar-function, which is basically just several"cat /path/to/file" in xsetroot -name, and rerun the function every 30s. - redraw entire statusbar by calling xsetroot. Thus, leaving me with scripts only running every 30s and still getting "instant" updates on a keypress. I like your statusbar, can you share the code please? If you got further questions, just ask/contact me. Well… for defcon, again, check my git! @defcon: Ok, please open another thread for this. I'll help you there but I guess here is the wrong spot for this discussion. @graph: thank you. mind sharing at https://bbs.archlinux.org/viewtopic.php?id=146959? Here's my current configuration. I've applied several patches, including some written by myself. I have to admit, though, that a lot of the configuration is copied from jasonwryan. Good work over there! What's the font/terminal? If it's URxvt, can you share your font settings and Xresources? Indeed, it is. Here's my Xdefaults configuration: http://sprunge.us/YFIR. I post a new screen here because a lot change came to my dwm. statusbar is loaded from RAM now but it's synch is synchronous, will be changed to asynchronous in future maybe if there is an efficient way. statusbar can be refreshed via shortcut or also get's instant updates on volume keys (thanks graph for providing your scripts → credits to graph!). The "icons" in the statusbar adjust dynamically depending on their status (works for bat/ac, wlan signal strength(thanks graph) and volume). Also "upgraded" to systemd which provides some really fast boot. It looks like when synchronizing. And when not synchronizing . How did you get that notification in the statusbar when dropbox is syncing? The sync symbol pops up when sync my dwm statusbar. It's not from dropbox. Even if it would be a cool idea, but I guess this won't work out well with my current settings, so I don't try to investigate. It looks like http://ompldr.org/tZjN0bg when synchronizing. And when not synchronizing http://ompldr.org/tZjN0cg. That. Is. Amazing. I love what you've done with DWM! I switched to MATE for a bit, if I can get your setup working, it might get me to switch back to DWM. Glad to hear this es20641!